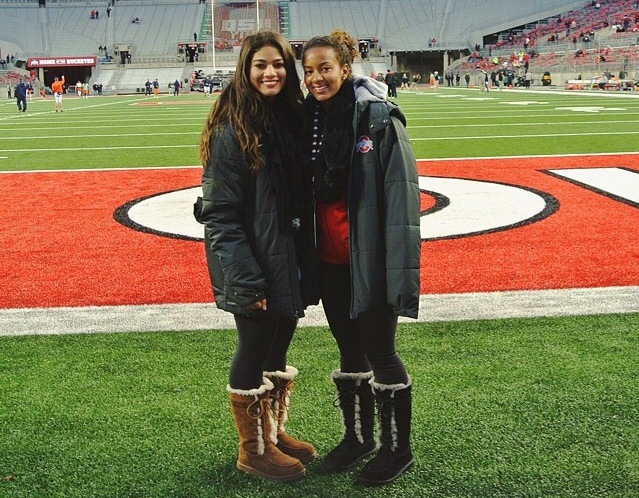 Brianna ’15 and Courtney ’16 Gazmarian standing on the Ohio State field. Brianna Gazmarian ’15 and her sister Courtney ’16 were 6 and 5, respectively, when they played in their first soccer game together. They have played together their entire lives, and that will not change when Brianna graduates in June. 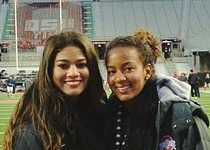 Both sisters have committed to play soccer for the Ohio State Buckeyes. “Columbus is our new home. We are still going to be together as a family, just in a new city,” Brianna said. The sisters have been on the same team numerous times throughout their lives. From their first AYSO game when they were in elementary school, to the Harvard-Westlake middle school team, and then to varsity, the sisters have always been by each other’s side, even at home where they share a room. The sisters spend most of their free time playing soccer, or doing other athletic activities like going for runs, or practicing skills. “Every weekend we have our routine of going out to a soccer field down the street and doing touches and kicking the ball at what we call ‘the wall’,” Courtney said. Brianna agrees and thinks that they motivate each other. Brianna will graduate in June and head to Columbus. She will spend one year alone before her sister starts school the following year. “It will be tough because I’m an emotional person so ill call home and say ‘I miss my family. I miss you guys I wish you were here’,” Brianna said. Courtney believes that their year apart will strengthen their bond and relationship. Brianna committed on her birthday November 8, 2014 which she called “a pretty good 18 birthday present.” She will head to Columbus in the Fall. Courtney committed in early December of last year and is excited to start playing for the Buckeyes in 2016. “I’m just super excited to play division 1 ball and ready for the obstacles and challenges ahead of me. I’m so thankful for the opportunity I have and I hope to become a stronger player,” Courtney said. The sisters will spend another three years playing together at Ohio State. Brianna is also looking forward to attending and playing soccer for the same college as her younger sister. As for the future, both sisters are hoping to incorporate their love of sports in to their professions. Brianna is considering being a sports psychologist and Courtney is considering being a sports agent. One of Courtney’s fondest memories of playing soccer was at a tournament in San Diego. “I will never forget when Brianna and I went to this big tournament surf cup in San Diego,” she said. “I sat and watched her play in the championship game and win in overtime and I was cheering and so pumped because I got to play next. Turns out my team won the championship game too and we both had medals and jackets. Our parents got jackets too and embroidered then with ‘MOMMAGAZ’ and ‘POPPAGAZ’. I will never forget that memory”. Late last year Brianna underwent ACL surgery.